The Young Family of Chesterfield invites you to enjoy our special brand of Virginia hospitality at the Half Way House, Richmond's landmark for intimate fine dining. The Half Way House was built in 1760 on a grant of land from George II of England, by a patent dated 1743. 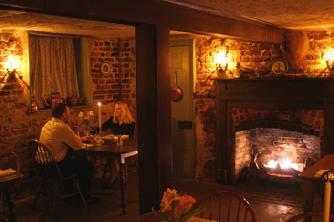 The Manor House is original and furnished in authentic antiques. Among its famous guests were George Washington, the Marquis de LaFayette, Patrick Henry, Thomas Jefferson, Robert E. Lee, U.S. Grant, James Whitcomb Riley and scores of others. 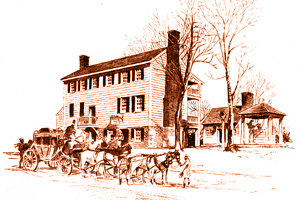 In fact, as the horse change and rest stop for the Petersburg Coach, everyone who traveled South of Richmond, from the Revolution untill late in the 19th century, stopped here, if only for rest and refreshment. A cordial invitation is extended to Ladies and Gentlemen who wish to inspect the premises. Long noted as one of Richmond's most beloved treasures, the Half Way House Restaurant offers a truly unique experience. Serving Luncheon and Dinner. Private Dining is offered for your most important Occasions. We look forward to serving you.